Statement earrings don't have to be heavy! Spirit Hoops are lightweight and very comfortable. These eye-catching earrings are the easiest way to add a lot of fun to any outfit. 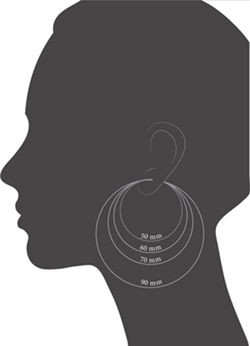 All Earrings are high quality hypoallergenic stainless steel. Though Spirit Hoops covers can be worn with other earrings, we recommend pairing them with a set of Spirit Hoops earrings for a perfect fit. With a pair of spirit hoops, you can mix and match any covers you like for your own unique look. Covers designed and manufactured in the USA. Check our FAQ page for more information.